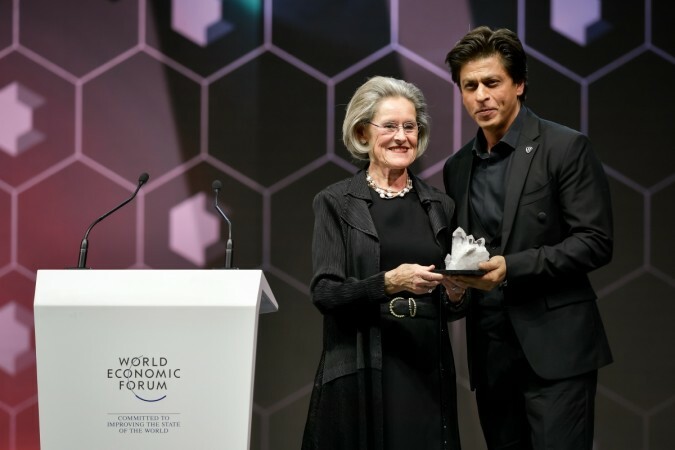 Shah Rukh Khan on Monday received an award at the World Economic Forum in Davos for raising awareness about human rights issues and his work for acid attacks victims. SRK said that he felt honored to receive the 24th Crystal Award along side Elton John and Cate Blanchett. The Annual Crystal Awards ceremony, which opened the World Economic Forum summit in the Swiss ski resort, celebrates the achievements of outstanding artists who have shown exemplary commitment to improving the state of the world. “Honored to receive the World Economic Forum’s 24th Crystal Award, together with Elton John and Cate Blanchett. My fan moment,” Shah Rukh tweeted after receiving the honor. “We, the powerful, need to get out of the way, to pick the barriers apart, the ones that give us names and races and colors and hierarchies,” SRK said. Shah Rukh Khan is the founder of the non-profit Meer Foundation, which provides support to female victims of acid attacks and major burn injuries through medical treatment, legal aid, vocational training, rehabilitation and livelihood support. We are super proud of our King Khan, for paving the road and inspiring so many millions of us to make a difference, but silently, in this world. We love you Mr Khan. And congratulations!! !